This is the last peek I am going to share until my Bro and SIL get the quilt. Sadly that means you won't see the finished quilt until May after their baby shower. There is something you need to know about my little bro, he is a peeker and he is a reader of my blog. If I put a link up here to a pic of the quilt and say "hey bro, don't click this. " He is absolutely going to click it. So here is one last peek to torture my bro and make him wait to see the quilt. Don't worry bro, you only have to wait a month WAHAHAHAHAHA!!! Have I mentioned that I am using Care from Obsessively Stitching First Quilt Ever tutorial? I don't know if I have sung her praises enough. 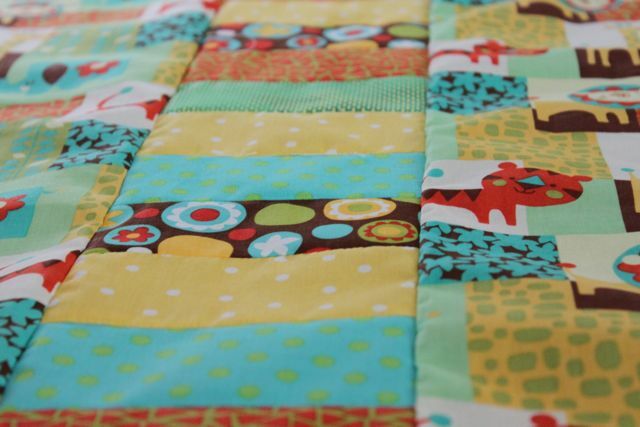 If you are thinking about making your first quilt and think, "it's too hard." You have to try her tutorial. She made me look like a rock star with my first quilt . I made this last year when I was a straight line sewer. I had only followed a few patterns for simple bags and I was making mostly pillows. 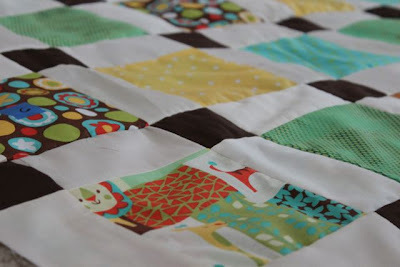 If you can sew 2 pieces of fabric together, you can follow her tutorial and make your first quilt!! ahhhhh omg it's looking goooood!!!! it looks wonderful!! they are going to love it. You are an awesome big sis!